It’s a sweet, fruit flavored gel, with a bit of lime juice to balance the sweetness of mango. Combined with a hint of cream and zippy ginger it’s a like a fancy drink in edible form! The jalapeño infused vodka is just discernible as undertones of spice while eating the jelly, but leaves a pleasant tingle on your lips and tongue. 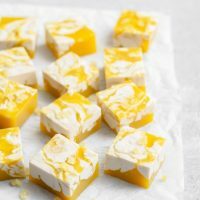 When it came to naming this recipe, I admit I wanted to pick something a bit more sophisticated than vegan mango jalapeño jello shots. But mango cocktail gels doesn’t fully explain them and ‘agar mango jelly spiked with jalapeño infused vodka with a ginger cream swirl’ just doesn’t quite roll off the tongue, haha. But no matter what you want to call them, these sweet treats are very enjoyable to eat! Just a quite note, you 100% can make these booze free. 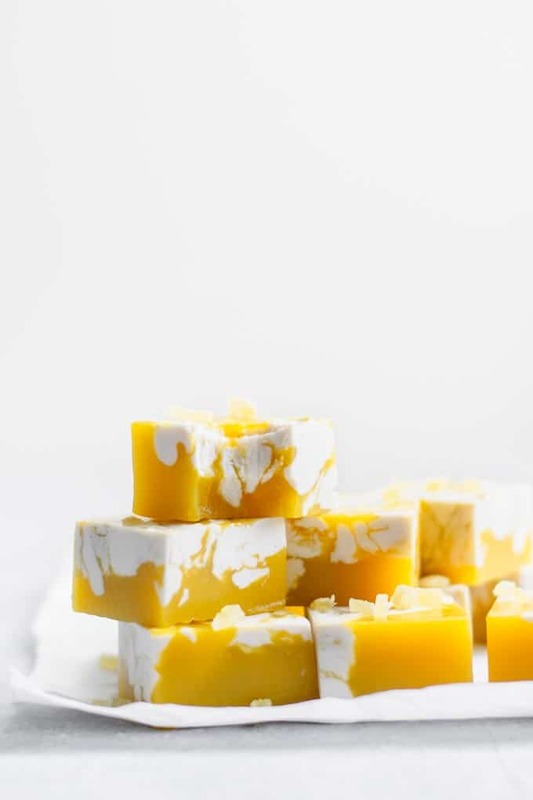 They’re delicious as just a mango jello with ginger cream swirl, no vodka or jalapeño needed, which also makes them kid friendly and appropriate as fairly healthy sweet treat any time of day or week! I’ll give the details on the virgin version below. 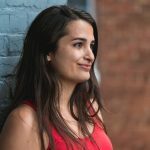 I’ve never had a jello shot (because I’ve been vegetarian my whole life and gelatin is made from animals), and I have to admit I don’t really feel like I’m missing out on anything there. I mean, maybe if I had known about the possibility of agar jello in college or grad school I would have made them and enjoyed getting drunk on sugary gelled alcohol, who’s to say! But these mango jellies are different! 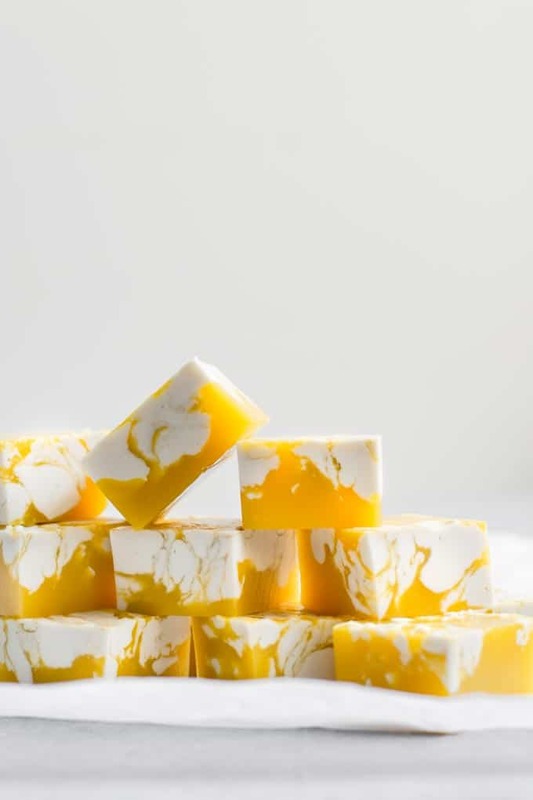 They are made with agar (sometimes called agar agar), a gelling agent that’s derived from seaweed, and so completely plant based. Agar gels to a different texture than gelatin–it’s firmer and less jiggly. This makes it perfect for cutting up into small pieces, perfect for picking up and snacking on! When it comes to making the jelly, you want to use the general rule of 1 tsp of agar powder to 1 cup of liquid. As you add acidic or alcoholic ingredients you need to increase the amount of agar, as those can inhibit the setting of the gel. Agar can be purchased in two forms: powder and flakes. Either can work (technically), but I have a huge preference for the powder. The flakes (which you need to substitute 1 tablespoon agar flakes to 1 teaspoon agar powder) are a lot harder to dissolve. This means you’re more likely to end up with gels that have some areas around the undissolved flakes that are highly gelled and the other parts of the jelly to be softer. Unfortunately for reasons unknown to me, most health food stores in the US seem to just stock the agar flakes and not the powder! However, you can easily purchase the powdered agar at Asian grocery stores or online from Amazon. Similar to gelatin, for best results using agar, first bloom the powder in liquid. All this means is that you are hydrating the agar. It swells up and softens as it sits in liquid, making it easier to dissolve when it boils. Agar dissolves at 185 ºF (85 C), so the mixture needs to come to a boil (liquid boils at 212 ºF/100 C) for the agar to dissolve. It also is not instantaneous (especially if you use flakes instead of powder), so you want to keep it at a low boil for a few minutes to ensure full melting and incorporation of the agar. And that’s really all there is to working with agar! First, you’ll want to infuse the vodka. I can’t believe how easy it is to infuse vodka, and this might become a new fast habit of mine! All you do is take a fresh jalapeño pepper, wash it and cut it in half lengthwise (don’t remove the seeds or pith). Place the sliced jalapeño in a clean glass jar and pour vodka overtop to cover it (at least 1/2 cup if you’re making a single recipe, though up to 2 cups of vodka for a single pepper). Shake the jar and then stick the whole thing in the fridge and let is sit for a minimum of 8 hours before straining out the jalapeño and any seeds or pith that may have gotten loose. If you’re drinking it and sensitive to spice you can remove it after 4 hours, but I made a batch of mango jelly with 6-hour infused vodka and could not taste the jalapeño. I recommend letting it sit overnight for about 12 hours. To make the mango part of the gels, simply combine mango juice (you can purchase mango juice blends from most grocery stores), freshly squeezed lime juice, and the jalapeño vodka in a pot. Sprinkle the agar powder over top and let sit for 10 minutes. Then, bring the mixture to a boil and once simmering away whisk to combine the agar. Let the mixture boil for a few minutes (covered so as not to lose evaporating water) to ensure full dissolution. You don’t have to leave this up to chance! Test the mixture by grabbing some liquid with a spoon, stick it in the fridge on a plate and check back in about 10 minutes. If it’s gelled, then the mixture is good to go! Leave the pot covered so it stays warm and liquid while you test. Pour the mango and vodka mixture into a mold. Line the mold with some parchment paper so that the paper comes over the edge of the mold for easy removal of the jelly once it’s firmed. I like to use a ~6×8″ pyrex container, but you can also use an 8×8″ square pan or a 8″ round pan. You want to let this first layer set for about 15 minutes in the refrigerator while you prepare the second layer. This lets it gel just enough that the two liquids will remain separate as you swirl them into each other. 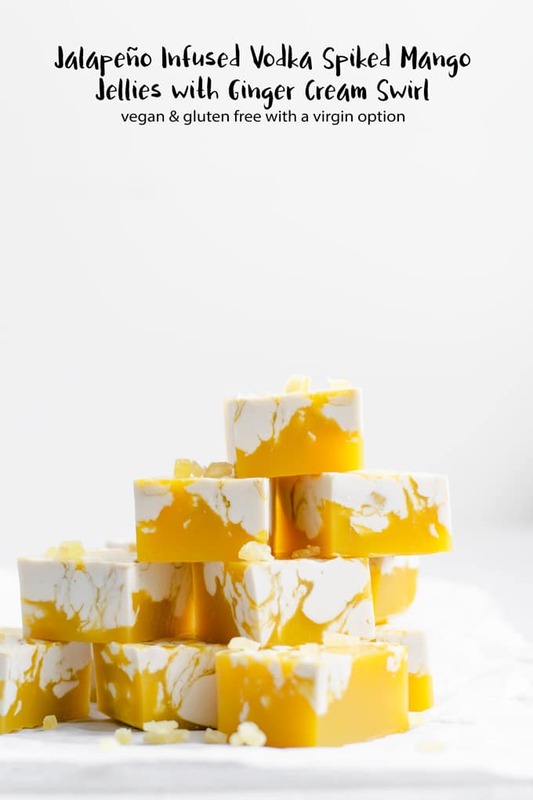 This second layer is made of a lightly sweetened ginger-flavored cream and swirled into the mango-jalapeño gel. 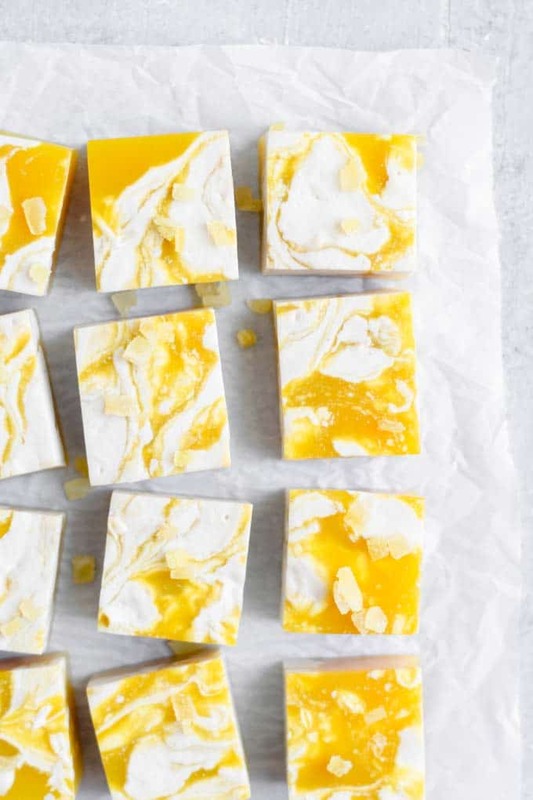 Ginger juice is mixed with plant milk and a bit of sweetener to make a zippy, creamy gel. I whip up my own cashew milk for this recipe as it’s easy and quick to do with a high speed blender. But, store bought soy, cashew, almond, or coconut (the kind in a carton not canned) milk would also work! For the ginger juice, while you can make your own by blending fresh ginger root with just a bit of water and then straining it through cheese cloth or a nut milk bag. Or you can be lazy like me and buy it bottled from the asian section of a well stocked grocery store or from Amazon. Gelling this cream has the same general process as the juice layer. Add the liquid to a pot, sprinkle over the agar powder and let it sit (bloom) for about 10 minutes. Then bring it to a boil, whisk, and let it boil away for several minutes to fully dissolve the agar. You can run the same spoon test to make sure the mixture will gel. Wait until the mango layer has gelled enough that it’s a bit jiggly but the top feels a bit like it has a skin forming on it when touched. 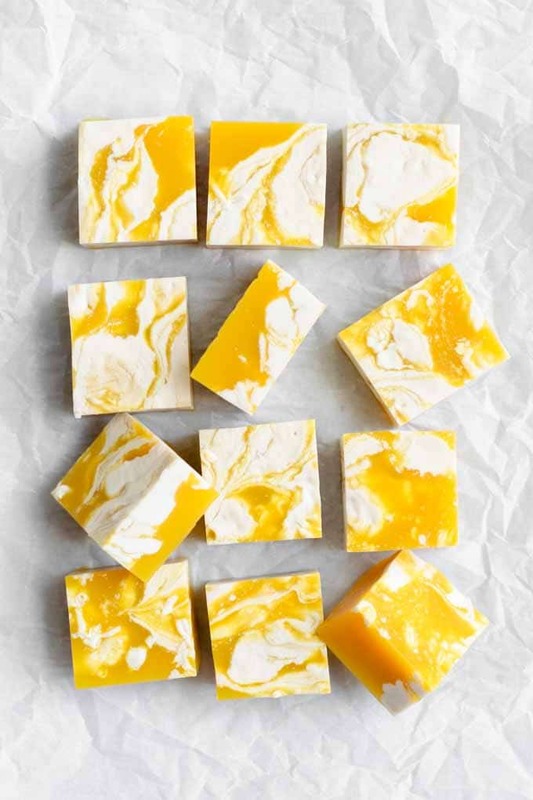 This means that when you pour over the ginger cream it sits on top of the mango layer and doesn’t sink in and combine immediately. If the ginger cream starts to cool and gel while you wait, you can always heat it back up because agar is a fully reversible gel! This means it can solidify and then be warmed to melt as needed. 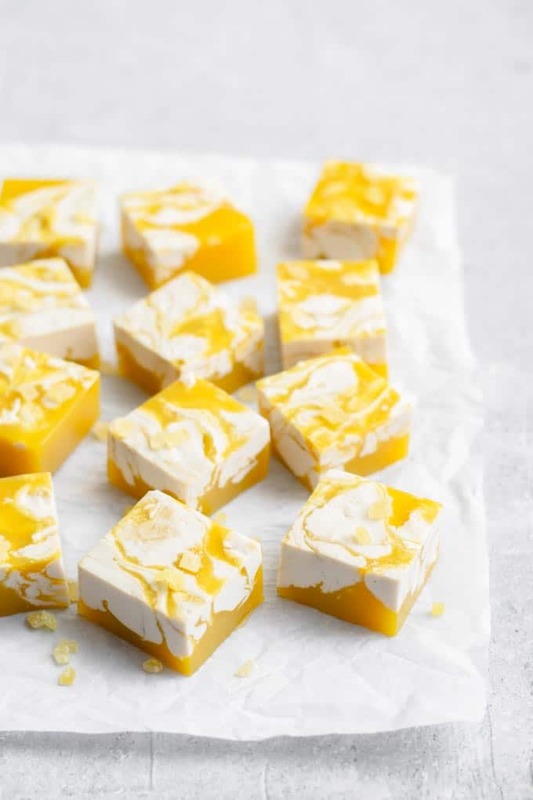 Once the mango layer has firmed enough, pour the ginger cream over top, then take a knife and swirl it through to create the swoops of cream through the mango jelly. This is exactly how you marble cake. Then just let the whole thing cool to room temperature before sticking it in the fridge! I like to leave it uncovered until it’s fully gelled and firmed so condensation doesn’t form on the lid as it chills. The jelly will firm up completely over a few hours, or just make it the day or two before. Then can be removed and cut to size! Keep in mind that as written there are 4oz of vodka in these gels, so if you cut them into 12 pieces like I do, then you need 3 jellies to consume 1oz of vodka. This means they’re not particularly strong so you get to enjoy more without overdoing it. Making these vegan jello shots alcohol free is easy! Swap the vodka for more mango juice. That’s it. No other changes needed! To make it still be jalapeño infused, Combine the mango juice with a sliced jalapeño, bring it to a boil in a pot, then let it sit for 30 minutes as it cools to infuse the juice with the pepper flavor. Then, proceed with the recipe! I hope you enjoy this sophisticated, plant based jello shot! They’re so fun to put out at parties, and we enjoy the virgin versions as a weeknight dessert. If you make these vegan mango jalapeño jello shots, leave a comment below and rate the recipe on the recipe card. And please share your photos with me on Instagram, tag @thecuriouschickpea and #thecuriouschickpea, I love seeing your creations! Make the jalapeño infused vodka: put the jalapeño in a clean glass jar and cover with vodka. Use at least 1/2 cup of vodka, but feel free to make extra infused vodka, up to 2 cups total. Shake and place in fridge for 8-12 hours. Strain to remove the jalapeño and any loose seeds. Make the mango cocktail layer: Whisk together the mango juice, jalapeño infused vodka, and lime juice. Sprinkle the 2 1/2 teaspoons of agar powder over top and let sit for 10 minutes undisturbed. Cover the pot and turn the heat to medium to bring to a low boil. Whisk the mixture to combine the agar, then keep at a low boil for about 5 minutes to fully dissolve the agar. Transfer to a parchment lined mold, a 6x8" pyrex dish, 8x8" square pan, or 8" round pan work well. Leave some parchment hanging over the edges to help remove the gels at the end. Stick the mango cocktail gel in the fridge to partially firm up, about 15 minutes. Meanwhile make the ginger cream layer: In a blender blend the cashews, water, ginger juice, and maple syrup. Alternatively whisk together the plant milk of your choice (see notes) with ginger juice and maple syrup. Transfer to a small pot and sprinkle the 1 1/2 teaspoons of agar powder overtop. Let hydrate for 10 minutes. Cover the pot and turn the heat to medium to bring to a low boil. Whisk the mixture to combine the agar, then keep at a low boil for about 5 minutes to fully dissolve the agar. Once dissolved and the mango gel has set so that it is very jiggly but has a film overtop when touched, pour the ginger cream over the mango cocktail gel. Use a knife to swirl the ginger cream through the mango gel. Let the gels cool completely to room temperature, then place uncovered in the fridge until completely chilled and firm, at least 4 hours or overnight. Remove from the mold, cut into pieces and serve! Can be served cold or room temperature. *For the ginger cream, you can substitute the plain or unsweetened store bought plant milk of your choice. Use 1 1/4 cups non-dairy milk. *To make ginger juice, combine fresh ginger (coarsely chopped) in a blender with just enough water to get things moving, blend and then strain through a cheese cloth or nut milk bag. More water = less concentrated ginger juice, so adjust to taste. *To substitute agar flakes for the powder, use the conversion 1 tablespoon agar flakes = 1 teaspoon agar powder. 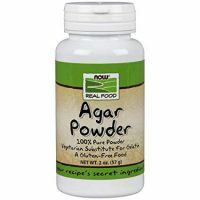 I recommend using agar powder if at all possible. If using flakes do not skip the step to hydrate the flakes in water and let boil for 10 minutes to make sure it fully dissolves. Adapted from my Pomegranate Sangria Gels Recipe.